Photo: Girls from our Philippines girls home are happy to celebrate the success of their on-campus hen house. 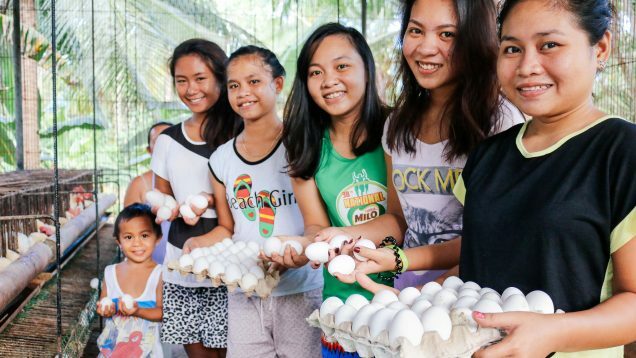 We are happy to report that our hen house project has been operating successfully since we recently relaunched it as part of our farmland enterprise on the island of Cebu, Philippines. 65% of our 250 hens have reached maturity and are laying a recent average of 1,134 eggs per week. There is such a high demand for fresh eggs from local neighbors that our native team has been selling them directly to the consumers on a daily basis. Currently, the weekly net profit from selling our eggs has been around $97, thus our monthly net profit has been around $388. Along with your support, our hen house project will help with some of our funding challenges, providing more profits to help at-risk children and orphans succeed in school. Other parts of our farmland enterprise on Cebu continue to flourish as well. We currently have 103 banana trees, and our last harvest in September yielded 5 large stalks of bananas. An average single bunch yields a profit of $6.00 which quickly adds up since we harvest bananas weekly. We are also now growing papaya plants, our newest crop, which are harvested monthly. And we are cultivating chilies as well, which are harvested weekly. In addition, we are harvesting okra, bell peppers, and eggplants almost every day. Over time, our fishery has suffered some damages in that the small pond structure has many cracks and the large pond structure has a few minor cracks, so we moved the fish from the small pond to the large pond, thus salvaging our fish crop — we sold the salvaged 150 fish for $63. On-demand sales continue to yield steady profits for our programs, which is a positive result of making a change to our sales plan recently. Instead of doing mass harvests to sell at market, we are now selling smaller harvests on demand to families and smaller vendors. But we do need to repair both the small and large ponds in our fishery for the sake of future fish harvests. We are seeking to raise $446 for this need, which includes the materials and labor. 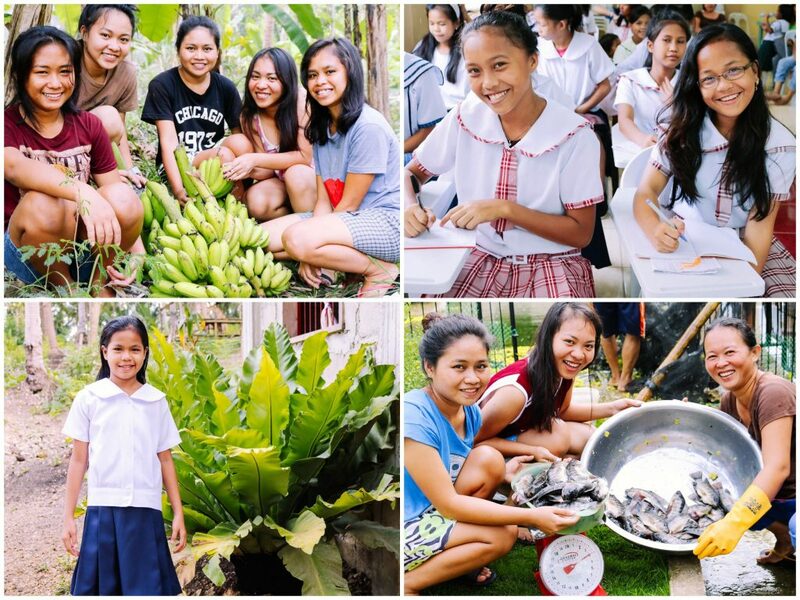 Photo inset: (Top-left): Our 103 banana trees continue to flourish and help to provide funding for our Cebu programs. (Top-right): We are seeking to purchase more desks for our Children’s Hope Center to ensure all students enrolled have a place to do school work. (Bottom-left): Our Hope Center program ensures that children such as Mylene* receive tutoring and fresh-cooked meals. (Bottom-right): Our fishery needs repairs so the fish harvested & sold can continue to yield steady profits for our Manila programs. We want to share the redemptive story of a child who enrolled in our Cebu Children’s Hope Center in May, 13-year-old Mylene. * Her father is a security guard, her mother is a housewife who takes care of her home and children, and Mylene has 3 brothers and 1 sister. Her father earns just $175 per month, or less than $6 per day. The average Filipino family earns $432 per month, so Mylene’s family is living well below the poverty line. It’s just barely enough to put basic food staples on the table and pay rent. Lastly, with your support, we are seeking to purchase 20 more desks for our Children’s Hope Center to ensure that all 40 of the children enrolled have a comfortable place to sit and work on their school work. Thus, we need to raise $357 to purchase 20 desks. The children took their end-of-semester exams in August, so now they are on break from their studies, enjoying fun activities such as volleyball and swimming, before school resumes at the end of this month. We are ever grateful for your continual prayers and support which enable us to continue to bless and enhance the lives of our children and to break the tragic cycle of poverty.